Having a strong IT infrastructure is crucial to bottom-line growth and competitive advantage. Everyone’s pretty much on the same page about that. But the digital approach to business strategy has some unexpected ramifications. First, it means CIOs aren’t just “the IT guys” anymore. They’re now stakeholders in almost every business decision. Second, it means that other C-suite execs — especially CFOs — need to take an active interest in IT. 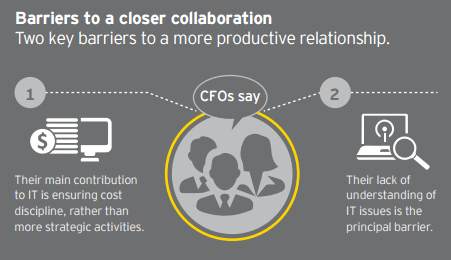 Roughly 61 percent of CFOs report increased levels of collaboration with CIOs in recent years, and 71 percent say they’re more involved with the specific IT agenda. This shift in tactics isn’t just a coincidence — it’s a deliberate move that’s paying real dividends. According to PricewaterhouseCoopers, companies with a high level of collaboration between C-suite execs and the CIO are four times as likely to be “top performers” in growth and innovation. It’s the same reason the pundits called for stronger alliances between CMOs and CIOs a few years ago: shared interest. When marketing automation and analytics technology took off, marketers realized they needed to weigh in on software procurement, and CIOs realized they needed to keep IT decisions aligned with larger business goals. CFOs and CIOs collaboration happens along the same lines but can affect the company on a much larger scale, since they aren’t limited to marketing. Modern business technology is more prevalent and accessible than ever before. That means almost any business can grow by implementing the right solution (whether it be CRM, business intelligence, accounting, or otherwise). However, it also presents new challenges, such as sorting through software markets to separate value from dross, matching effective solutions with real business needs, and reassessing your existing infrastructure and systems. What team is better equipped for this challenge than your CFO (who specializes in financial planning and risk management) and CIO (who supports business goals with relevant technology)? One of the biggest areas of common ground for CIOs and CFOs is cybersecurity. From a technical standpoint, cybersecurity is about patching vulnerabilities in the IT environment to prevent unauthorized access and minimize exposure to threats. From a business standpoint, security vulnerabilities represent a risk to company assets, and even shareholder value (for publicly-traded companies). This phenomenon may be more evident for companies that process consumer financial transactions (e.g. financial services, retail) but it’s universally applicable. According to security software firm McAfee, cybercrime costs the global economy over $400 billion per year. The growing adoption of business intelligence (BI) is another significant area of opportunity. 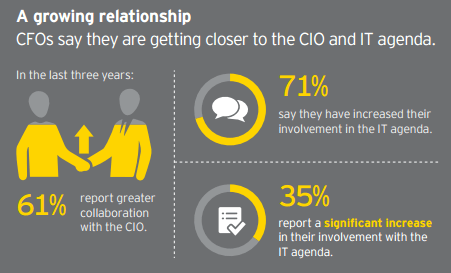 In their 2015 “Partnering for Performance” report, Ernst & Young found analytics and data management to be the top driver of collaboration between CIOs and CFOs. CFOs can use BI to increase profitability with advanced modeling and analytical tools (e.g. sales forecasting, segmentation, customer experience mapping). CIOs, meanwhile, are responsible for choosing the best BI platform and managing deployment, integration, etc. The proliferation of cloud technology has also brought new purpose to the CIO/CFO relationship. In the past, a software purchase required a large, one-time expenditure followed by a long period where the investment was recouped. As such, most CFOs concentrated on the upfront cost-benefit analysis of procurement. But the on-demand pricing structure of cloud software requires ongoing cooperation between CFOs and CIOs to monitor investment performance, consider modification, add-ons, alternatives, and other factors. 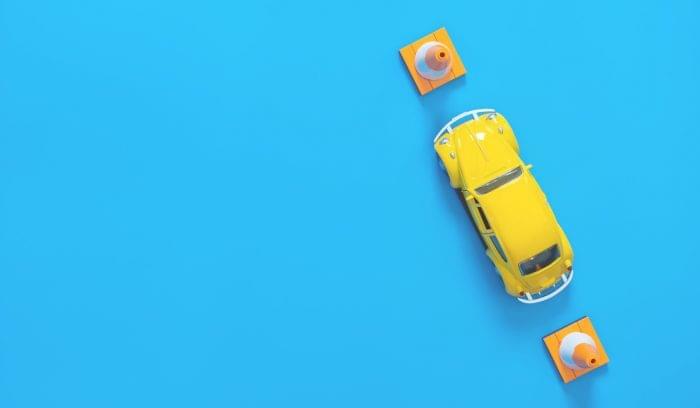 Initially, this might seem more taxing, but the beauty is that it makes business software an operational expense, rather than a capital expense, which is much more conducive to a technology-driven growth strategy. What’s Keeping the CIO and CFO from True Partnership? Lack of common language: Many CFOs struggle to find straightforward business value in a project proposal full of technical jargon. In the same regard, CIOs often struggle to articulate IT priorities in a way that promises bottom-line ROI. “Insufficient understanding of IT issues among finance executives” is the number one reason CIOs and CFOs have a hard time working closely together. CFOs overly-concerned with cost: CFOs have a reputation for hindering IT progress with stringent budgetary limitations. This may only be true in some cases, but it reflects a more systemic problem: CFOs view IT as a cost center, instead of a source of growth, refinement, and innovation. 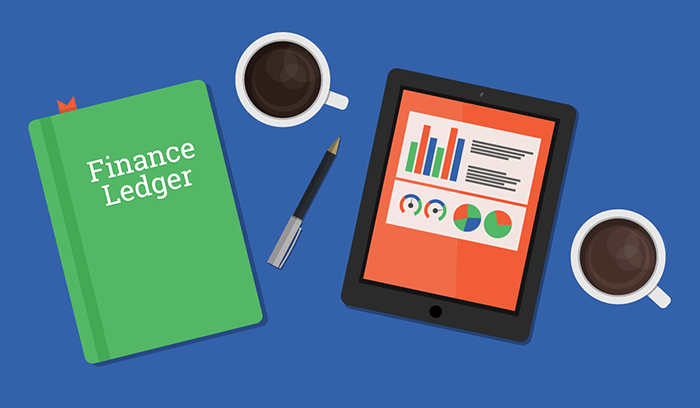 Organizational hierarchy: Seventy-two percent of CIOs report to the finance department, and by extension, the CFO. While there’s nothing inherently problematic about this structure, it can sometimes place CIOs in a position of perceived inferiority. 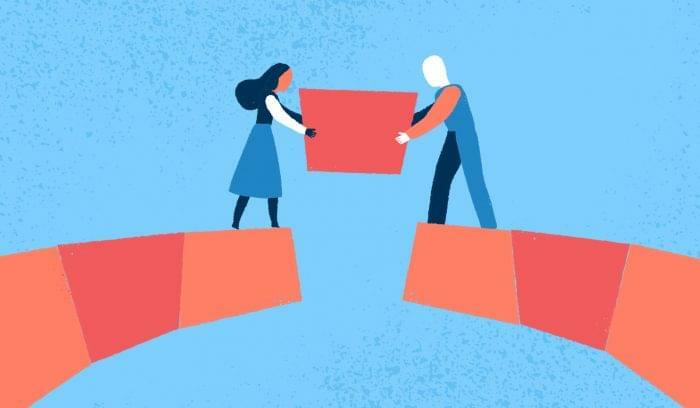 To create an environment of equal partnership, CIO need to have “a seat at the leadership table,” as Deloitte expressed it. Lack of accountability: Since CFOs are typically in the position of ultimate authority, it’s easy to paint them as overly-restrictive or unsympathetic to IT priorities. 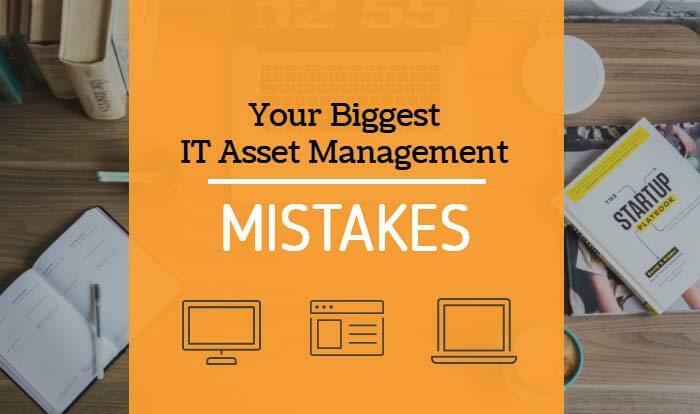 But CIOs still have an obligation to account for their investments. That means being able to prove ROI by presenting key performance indicators (KPIs) to finance in a clear, business language, and adhering to the same project management standards that govern the rest of the company. Make cybersecurity an integral part of broader risk management plans/conversations. Bring CIOs into the loop on leadership decisions that involve other C-suite execs (CFO, COO, CMO), especially where business objectives require new technology. Establish a common language so CIOs and CFOs can discuss IT initiatives with the same goals, improvements, and ROI mind. CIOs and CFOs should approach digital innovation (cloud technology, data analytics, etc.) as a shared interest and make joint decisions about risks, resources, and spending. Any healthy relationship requires equal effort from both parties, tempered by a willingness to compromise. CFOs should make an effort to rise above cost-efficiency monomania (maximize revenue, minimize cost, rinse and repeat), and treat IT investments as opportunities for growth. And CIOs should ensure their projects add clear value, not just innovation for sake of it. With some ground rules in place and a mutual sense of purpose, your finance and IT departments can work together to drive business growth through reliable technology.